The Syrian regime has accused Israel of conducting air strikes targeting ammunition depots at the Jamraya military compound, 10 kilometers to the northeast of Damascus. 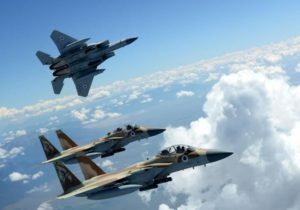 Syrian media claimed that most of Israeli missiles were intercepted, an information that so far could not be verified independently. In the wake of these strikes, Syria’s Foreign Ministry accused Israel of supporting armed groups that have shelled Damascus for days with “rockets and mortar rounds”. The scientific research center in Jamraya was established during the 1980s and is believed to be one of the most important research centers in the country, with weapons developed and stored there. An Iranian base has also been established in its vicinity, with several buildings that likely house soldiers and military vehicles. Israeli media are raising fears that the Syrian regime might be developing chemical weapons in the Jamraya base with help from Iranians. The strikes were also justified as a pre-emptive attempt to stop Hezbollah from acquiring game-changing weapons, which can be later smuggled to Lebanon and used against Israel. In the past, Israel had attacked convoys it said were transporting antiaircraft missiles and launchers to Hezbollah in the Jamraya area. Written by: Jaber Ali on February 8, 2018. Posted by Jaber Ali on Feb 8 2018. Filed under Headlines, World News. You can follow any responses to this entry through the RSS 2.0. Both comments and pings are currently closed.